Many philosophers claim that ‘ought’ implies ‘can’. In light of recent empirical evidence, however, some skeptics conclude that philosophers should stop assuming the principle unconditionally. Streumer, however, does not simply assume the principle’s truth; he provides arguments for it. In this article, we argue that his arguments fail to support the claim that ‘ought’ implies ‘can’. Paul Henne and Jennifer Semler are co-first authors. We are thankful to the members of MAD Lab and the IMC Lab at Duke University. We are also thankful for the comments of an anonymous reviewer at Philosophia. Hannon, M. (2017). Intuitions, reflective judgments, and experimental philosophy. Synthese, 1–22. https://doi.org/10.1007/s11229-017-1412-1. Kissinger-Knox, A., Aragon, P., & Mizrahi, M. (2017). Ought Implies Can, “Framing Effects, and Empirical Refutations”. 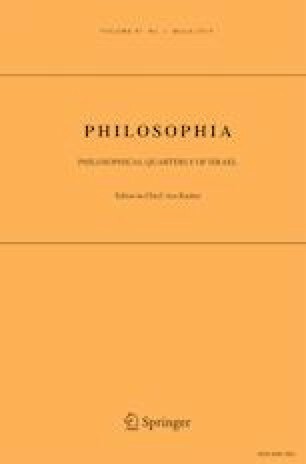 Philosophia, 1–18. https://doi.org/10.1007/s11406-017-9907-z.